For over a decade, BMW has dominated the world luxury car market, though its top-end luxury models are not the favorite members in its spectacular lineup. One such model is the BMW 7 Series that has confused the automotive industry. It arguably has the best in class technology and tough German quality, but it is not quite practical as a luxury sedan. 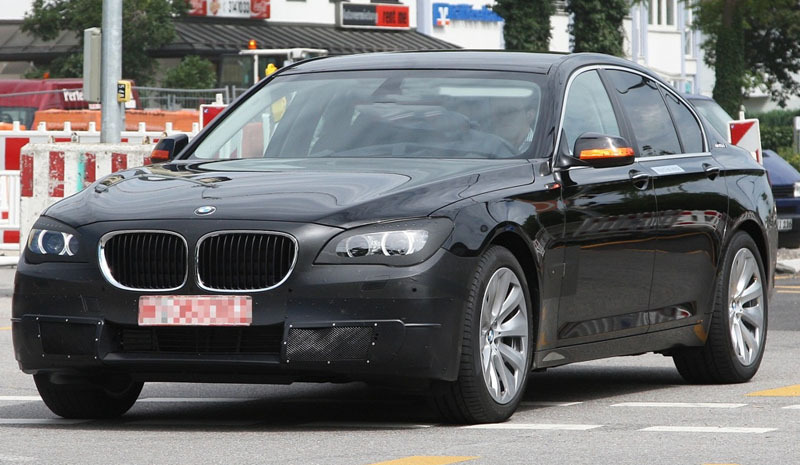 After revealing the facelift models or Life Cycle Impulses (LCI) of the X1 and X6, the next in line to join the German automaker’s 2013 LCI lineup is the BMW 7-Series. While the only changes seen on the LCI models of X1 and X6 were bolder fog lamps and revised paint job, BMW will have to chip in more for the upcoming 7-Series, as its German rival Mercedes is coming up with the next S-Class. According to BMW Blog, the subtle changes to the LCI product of 7-Series include new sound system, revised exclusive paint job and an upgraded power plant. It further reports that the German auto giant will offer new variants in the luxury sedan, which includes the 750d and 750Ld. Power will be drawn for both the variants from the same 3.0-litre engine that now comes with M Performance upgrade featuring extra turbocharger. This motor has a jaw dropping output of 381 hp and 740 Nm torque. For the entry level diesel, the 730d, BMW boosts the output to 254 hp from the previous 240 hp, and the torque jumps to 560 Nm. Expecting a launch in July, the new BMW 7-Series comes with three new body colors including, Havana, Glacier Silver and Midnight Blue. It also gets restyled LED headlamps. In terms of interiors, BMW introduces the next-gen iDrive system, with revised features and multi-touch knob. While the BMW 7-Series gives an option of 4X4 and 4X2 in Europe, the India spec BMW rolls as two-wheel-drive vehicle only. In India, the segment leader Mercedes S-Class is assembled via CKD kits, whereas the BMW 7-Series comes as a CBU, inviting more excise duty. However, the 7-Series has done fairly well in recent years due to its durability on Indian roads.